Bottle Challenge ! - How To Do This ? Today, at the supermarket I saw a water bottle very insteresting in its geometry. And I wonder if SolidWorks can handle this kind of designs. This is an image of a drawing that I made with some basic dimensions, the other you can freely asume. I will be working on some ideas, but I will be waiting for your help with ideas, models, etc. 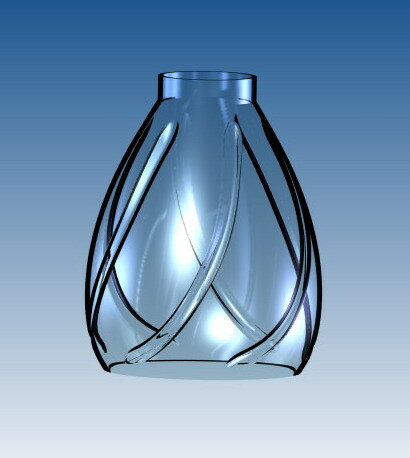 I used Rhino to model the bottle. It should be pretty much the same in SolidWorks. I got this far after 90 mins, don't want to spend the whole day =/. I think this is actually a good monthly activity, it was quite fun solving a few problems. The technical drawing made it fun and easy aswell. The models look very good indeed. Keep going... 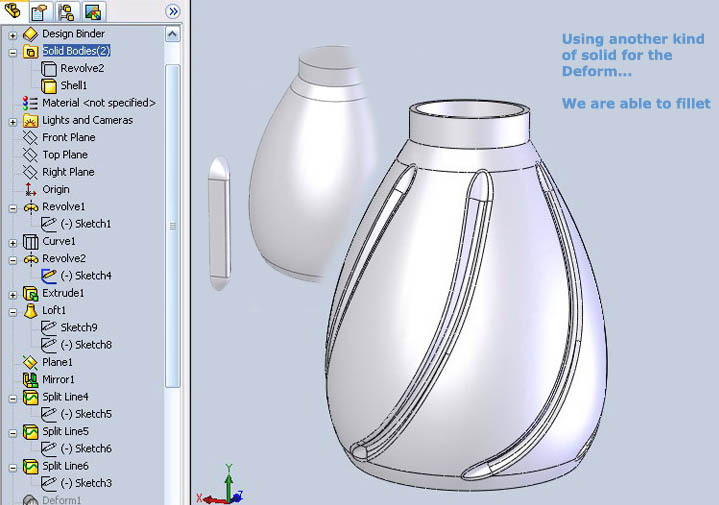 I dont have Rhino, but I will do my best with SolidWorks..
Well, I am trying to solve one item at a time. I used the Deform Feature to accomplish this. 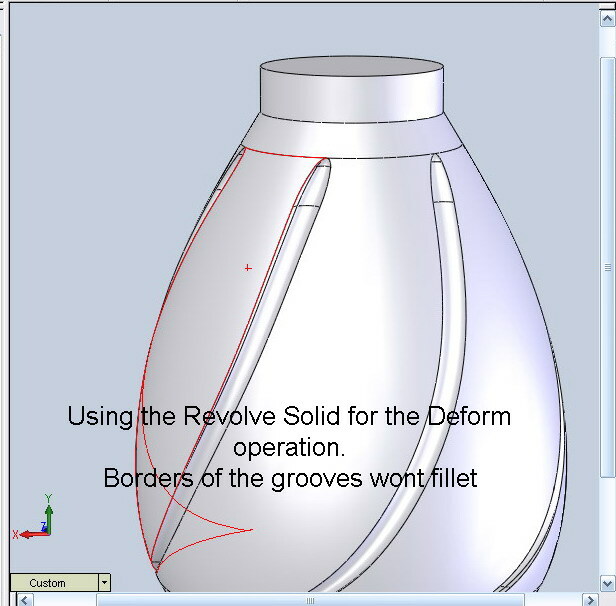 But it is tricky to work with that because if you use a revolve body to deform over the main body, when you subtract the bodies you securely would have a problem when you try to fillet the borders. The twist does not really look like it has constant radius. I think you have to do a sweep of circles with varying radius. And then you trim it and blend. Though I have problem in creating circles that is perpendicular to the rail. 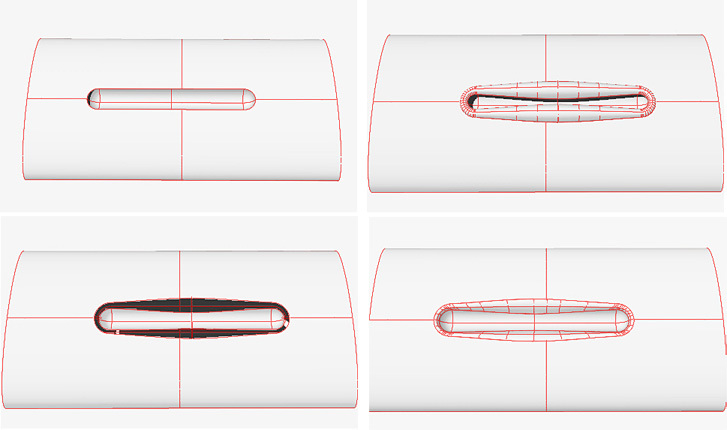 Do people do the Pipe-Split-Blend trick in solidworks? Projected the sketch as a curve in 3 sections. Swept the middle part of the cut out and lofted the points to get a nice smooth exit. Yes, the radius appears not to be the same, but it is a constant radius of 0.8mm. 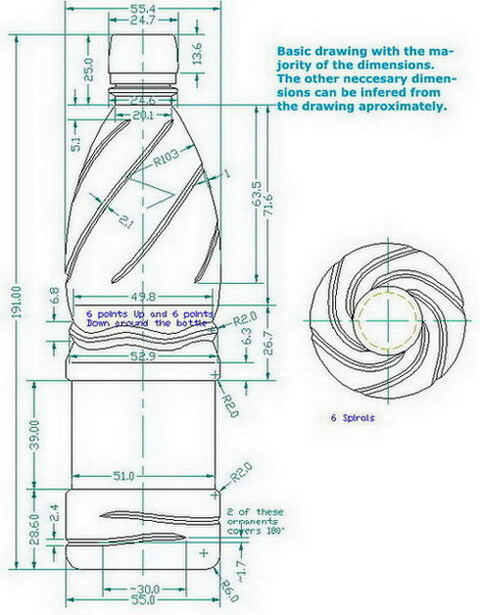 It "looks" different because of the way the spiral goes around the main body curve. We can use variable radius too. Wich is the Pipe-Split-Blend trick??? Let's say the fillet did not work for the surface in the first picture. To manually do the fillet you got to do a combination of pipe, split and blend, or something similar. You'll find out why the fillet doesn't work. By the way, are you using Rhino or...? The bottom twist is a tricky one, have any ideas?